More than 5,000 angels descended to SM Mall of Asia for the most anticipated event of the year-Angels Walk for Autism. Click here to watch video. The Angels Walk for Autism marked the closing of the 14th Autism Consciousness Week. This year, numbers surpassed the estimated forecast. From far as Cavite and Laguna, people converged together, alighting from buses, cars and even motorbikes. The registration area was already lined-up with people before the sunrise. “It was not difficult for our people to be taught, because I think they knew it was the right thing…. Life is not simply about enjoying every single moment for yourself; life is about living it also and helping others,” echoed through the Music Hall when The Heart of SM video was being played on their newly installed LED screen. A large tarpauline poster backdrop on stage with the words: “No other walk comes close….to an angel’s heart,” signifies the partnership between ASP and SM. Autism Guardian Angels Mr. Hans Sy, President of SM Prime Holdings; Ms. Annie Garcia, President of SM Supermalls; plus SM Committee on Disability Affairs, welcomed guests and rolled out the red carpet for autism. SM Mall of Asia hosted last year’s Angels Walk. And for the second time this year, with Eng. Bien Mateo, Chairman of SM-CDA as the Honorary Chairman for the Autism Consciousness Week. The giant mall has once again proven its sincerity and support for ASP projects. (SM Supermall hosts several ASP projects in Metro Manila and around the country). An anonymous angel passes by SM Mall of Asia. She was malling with her family and chanced upon the celebrations at the Music Hall. Seeing the huge crowd and the showcase of talents, she approached the registration table to inquire about the on-goings. “It’s good that your group is doing this,” she said, as she scanned through the ASP merchandise. After a few minutes, she whispered: “I would like to make a donation for autism.” She would have used the generous amount for her family, but that day, she made a big hearted decision. She chose autism. Her munificence gave the children colorful flaglettes to wave and loud confetti poppers to signal ASP’s 21st year in service for children in the spectrum. Other angels also quenched the thirst with overflowing bottled water and sandwiches also filled the hungry. We are overwhelmed and thankful. The 2010 Angels Walk for Autism T-shirts were sold out in less than two hours! 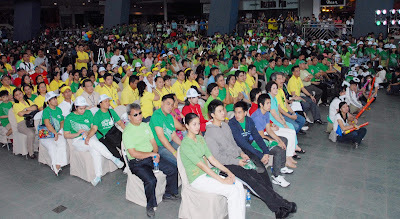 ASP Cavite Chapters, led by “Gobernadora” Jan Pena, had the largest contingent. Jan was still texting for additional orders, even after the Angels Walk. ASP Laguna Chapter Leader Riza Cansanay and her team came in a bus filled with hundreds of family and friends. 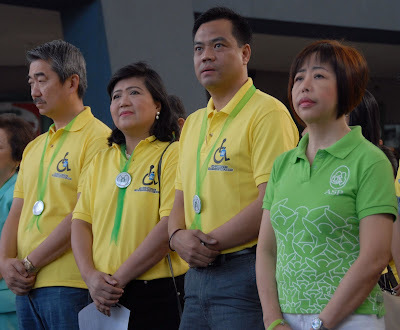 Representatives from the government: Autism Angel in Congress, Irwin Tieng of Buhay Party List; Ms, Lovely Romulo, Chair Person of NCDA; Ka Lauro Purcil, education committee head of UNCRPD; also came to support the activity. Participants were star-struck with Kapuso Stars from GMA7 and Ms. Janina San Miguel, beauty titlist, also came to join the walk in support of her brother with autism. Early mallers got a taste of autistic talents: John Kyle Binungcal, Deo Cruzada, Brendan Delgado, Gabe Nazareth, Jonathan Onnagan, Dean Hernandez, Justin Bitanga, Ron Famorca, Lanz Dimero, RJ Dordas, Ryan Baldia, Carlo Pabale, Michael Perez, Kyle Gutierrez, Caryl Alvarez, Christian Perey, Laurence Dulay, Aira Dela Cruz, Airam Cinco, Vell Barria, Thara Marie Santiago, Nikka, Daryl Lim, Bryan Lu, EJ and Desly Alvaro. Hey, don’t fret if you missed the walk. Pictures say a thousand words, click here to see photos. Or click here to watch another video. ASP thanks everyone for participating in Angels Walk for Autism. Thank you for your support! Till next year…..